The Woods Family, Adassa “MaMae” Brithwright, Leroy Campell, James O. Booker, S.H. Mayruk, S. Whittaker, Robyn Willard, The Sylvia & Herbert Woods Scholarship Recipients, Harlemites of All Ages. 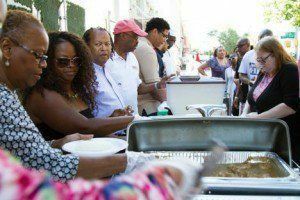 July 31, 2015 – Sylvia’s Annual Community Breakfast Party treated over 500 guests to smothered chicken, grits, homemade biscuits & and a healthy serving of Harlem’s rich artistic legacy. The event was complete with live entertainment which made for a great side-walk dance party. Event highlights included a retirement tribute to beloved waitress, Adassa “MaMae” Brithwright, who’s smile and motherly service greeted Sylvia’s guests for 31 years. 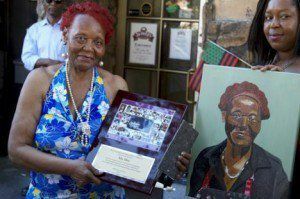 “MaMae” was presented with a self portrait by artist S.Whittaker. Robyn Willard commissioned S. Whittaker to paint the piece of MaMae as a tribute to her service. In “MaMae’s”retirement speech she ‘thanked guests for supporting Sylvia’s which kept her with a job, which put her daughter through school and is now a nurse.’ Crizette Woods, Sylvia’s youngest daughter, stated that those words are a true testimony to her mother’s legacy. In honor of Sylvia’s 53rd Anniversary, The Woods family has placed art from their private collection on limited view entitled “Sylvia’s Legacy Gallery.” Featured artist include: James O. Booker, Leroy Campbell and S.H. Mavruk. Gallery hours: Monday – Friday 11am – 8pm Sylvia’s Restaurant. Sylvia’s Restaurant, the Queen of Soul Food (TM) was founded in 1962 by the late Sylvia Woods with a seating capacity of 35, and to date is owned and operated by The Woods family. This world renowned culinary icon has proudly served presidents, international dignitaries, celebrities and Harlem residents alike. For over fifty-one years, Sylvia’s Restaurant has continued to flourish as “the world’s kitchen.” This family empire consists of a 450 seat restaurant, Sylvia’s Also Lounge, Sylvia’s Food Products – a nationally distributed line of products, and two successful cook-books. In 2001, in memory of Sylvia’s late husband Herbert, The Woods family founded the Sylvia and Herbert Woods Scholarship Fund which offers collegiate scholarships to Harlem and local residents based on the belief system that “a higher level of education should not be a high-end luxury, but a right to all those who seek it”. To date the fund has awarded 100 scholarships. Sylvia’s has appeared in numerous national & international media outlets and has been saluted by President Clinton; United States Congress; Governor Pataki; Mayors Koch, Dinkins, & Bloomberg; and the New York Stock Exchange to name a few.